At the weekend we were back in Dorset, this time for the annual Coast Path Relay. 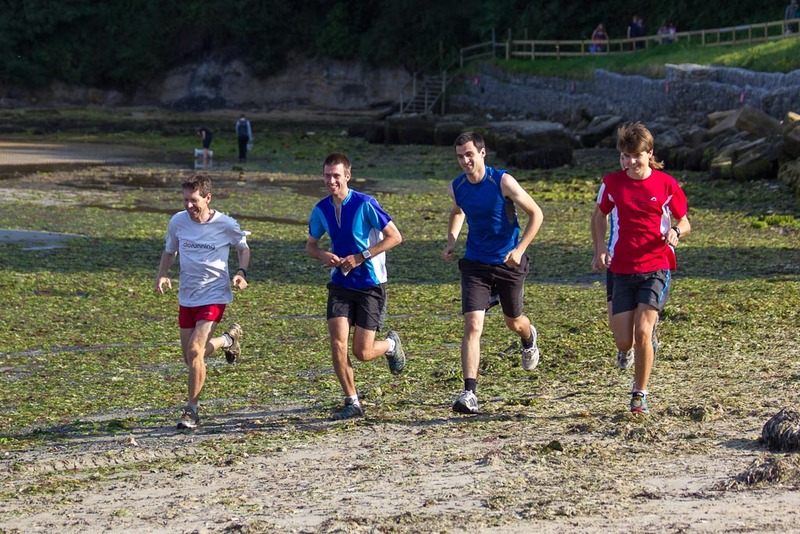 Originally down to run the first leg in Lyme Regis again, we made our excuses as this year we would have to travel down on the morning of the event. We consequently joined in the action at Abbotsbury Castle where I helped with the hill up from the coast, Christine ran to the end of the castle, and I took over to the next road bend. We then went up to Hardy’s Monument for the kids to have a run around. Having met our team captain there, Christine picked up an extra leg to Kimmeridge Bay. I took over from there for my usual leg to Chapman’s Pool unfortunately this year without a hill team to help me up to Clavell Tower. By the final climb I was reduced to a walk and wasn’t travelling much faster than yet another KERNO hill team making their way back to the car! Next stop was Studland Bay where the children had a good play on the beach and we enjoyed watching the displays by two Tornadoes and a Vulcan courtesy of the Bournemouth Air Festival. Sadly SOC had slipped some way off the pace of the other teams, not helped by a stray rock draining the oil from the sump of one of the team’s cars. There were still five of us to enjoy the final run along the beach to the finish line. We were greeted by a fly-by from a Spitfire and a Hurricane which perhaps reflects the more sedate pace of our team! The results speak for themselves. This entry was posted on Wednesday, September 5th, 2012 at 9:57 pm	and is filed under Family, Orienteering, Running, Travel. You can follow any responses to this entry through the RSS 2.0 feed. Both comments and pings are currently closed. Actually, now the handicap times have been added to the results our (relatively) small team doesn’t look so bad!